(A journey in the shadow of Byzantium) Flamingo Press; an Imprint of, Harper Collins Publishers, London, 1998. The author of the book retraces the journey of John Moschos, a Byzantine monk who wrote in 578 A.D. “The Spiritual Meadow” after travelling from Mt Athos to St Anthony’s Monastery in Egypt. Moreover, the Egyptian ancestry of the Celtic Church was acknowledged by contemporaries: in a letter to Charlemagne, the English scholar-monk Alcuin described the Celtic Culdees as ‘pueri egyptiaci’, the children of the Egyptians. Whether this implied direct contact between Coptic Egypt and Celtic Ireland and Scotland is a matter of scholarly debate. Common sense suggests that it is unlikely, yet a growing body of scholars think that that is exactly what Alcuin may have meant. There are an extraordinary number of otherwise inexplicable similarities between the Celtic and Coptic Churches which were shared by no other Western Churches. In both, the bishops wore crowns rather than mitres and held T-shaped Tau crosses rather than crooks or crosiers (compare icons below). In both, the hand-bell played a very prominent place in ritual, so much so that in early Irish sculpture clerics are distinguished form lay persons by placing a clochette in their hand. The same device performs a similar function on Coptic stele – yet bells of any sort are quite unknown in the dominant Greek or Latin Churches until the tenth century at the earliest. 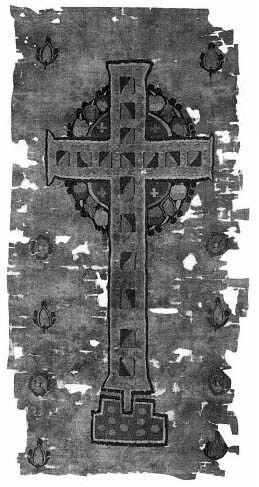 Stranger still, the Celtic wheel cross, the most common symbol of Celtic Christianity, has recently been shown to have been a Coptic invention, depicted on a Coptic burial pall (see image below) of the fifth century, three centuries before the design first appears in Scotland and Ireland. Photograph courtesy The Minneapolis Institute of Arts. “We sailed for twenty days and nights (reported the man on his return) and owing to a violent wind we were unable to tell in what direction we were going either by the stars or by the coast. But the only thing we knew was that the steersman saw (an apparition of) the Patriarch (John the Almsgiver) by his side, holding his tiller and saying to him: ‘Fear not! You are sailing quite right.’ Then, after the twentieth day, we caught sight of the islands of Britain, and when we had landed we found a famine raging there. Accordingly, when we told the chief man of the town that we were laden with corn, he said, ‘God has brought you at the right moment. Choose as you wish either one “nomisma” for each bushel or a return freight of tin.’ And we chose half of each. Then we set sail again and joyfully made once more for Alexandria, putting in on our way at Pentapolis (in modern Libya). p.420: “..As I stood outside the church, Fr. Dioscuros came over and introduced me to the Abbot. As we chatted, I happened to mention how St Anthony had once been a highly revered and much sculpted figure in my home country. Surprised, the Abbot questioned me closely about the Pictish images of his patron saint, and I described to him the scene shown on a particularly beautiful seventh-century Pictish stone from St Vigeans (near Dundee) which illustrates the scene in St Jerome’s Life of St Paul the First Hermit where the two saints meet for the first time. They eat together but cannot agree which of them should break the bread. Each defers to the other, until finally they ‘agreed that each should take hold of the loaf and pull towards himself, and let each take what remained in his hands’. 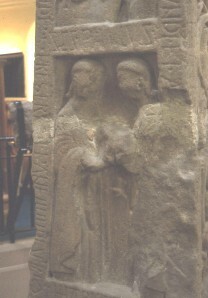 In the Pictish version of the scene, the two saints are shown in profile as they sit in high –backed chairs facing each other, with one hand each stretched out to hold a round loaf. 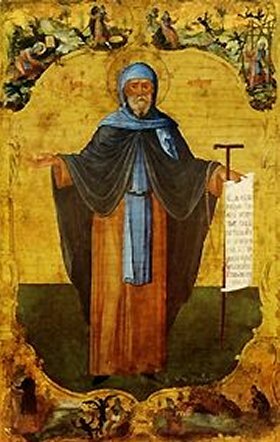 It was a very different image, I said, from any I had seen in the monastery, all of which showed St Anthony standing full-frontal, staring into the eyes of the onlooker, in the classic Byzantine manner. ...I looked where he was pointing. There, under the outstretched arm of the saint, a much smaller scene had been painted. Two figures, immediately recognisable as Paul and Antony, sat facing each other in a cave under a hill, on top of which grew a palm tree. Both figures had one arm outstretched to grasp a round loaf of bread with a line down its centre. 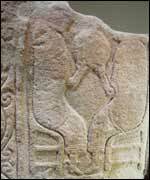 It was exactly the image sculpted by the unknown Pictish artists in seventh-century Scotland. p. 422: The only conceivable explanation of the similarity of the two scenes – one in Scotland, one in Egypt, whole continents apart – is the icon in the library must be a late copy of a much older Coptic original, an earlier version of which had somehow made its way from Egypt to Dark Age Perthshire, either by trade**, pilgrimage or in the hands of wandering Coptic monks. * A Copt is a native Egyptian Christian. Copts are the direct descendants of the Ancient Egyptians. The Coptic (antichalcedonian) Church is the portion of the Church of Alexandria which broke away from the other Orthodox churches in the wake of the Fourth Ecumenical Council in Chalcedon in 451. Sharing a common heritage previously with the Orthodox (Chalcedonian) Church of Alexandria, it traces its origins to the Apostle Mark. The word "Coptic" was originally used to refer to Egyptians in general , but it has undergone a semantic shift over the centuries to mean more specifically "Egyptian Christian". In 587 A.D., two monks set off on an extraordinary journey that would take them in an arc across the entire Byzantine world, from the shores of the Bosphorus to the sand dunes of Egypt. 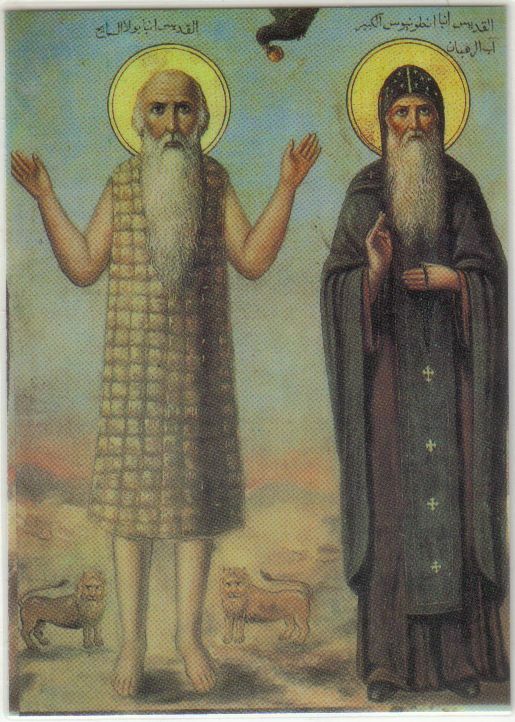 On the way John Moschos and his pupil Sophronius the Sophist stayed in caves, monasteries, and remote hermitages, collecting the wisdom of the stylites and the desert fathers before their fragile world finally shattered under the great eruption of Islam. 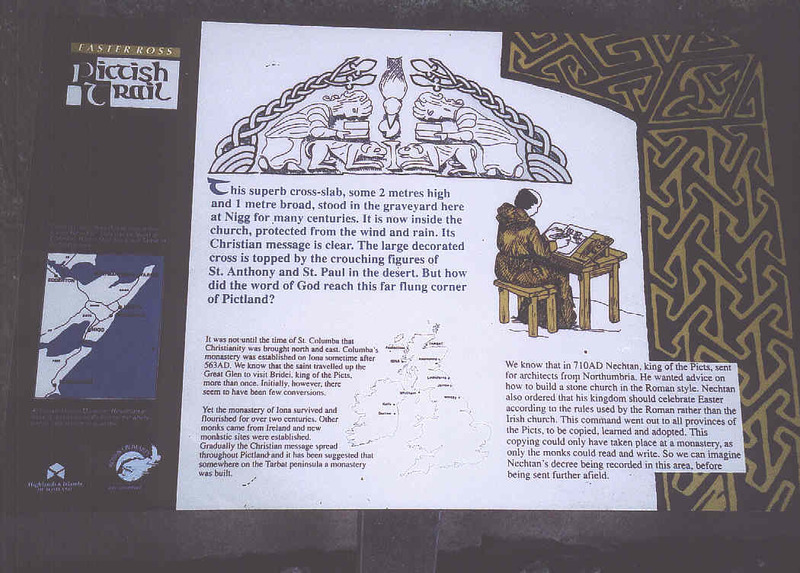 More than a thousand years later, using Moschos's writings as his guide, William Dalrymple sets off to retrace their footsteps and composes "an evensong for a dying civilization"
The Pictish Nigg Monument, Scotland (above) and explanatory notice regarding the two saints with raven and 2 lions engraved on it (below). The Ruthwell Cross is one of the oldest Preaching Crosses in Europe, and was first raised on the Solway towards the end of the 7th century. 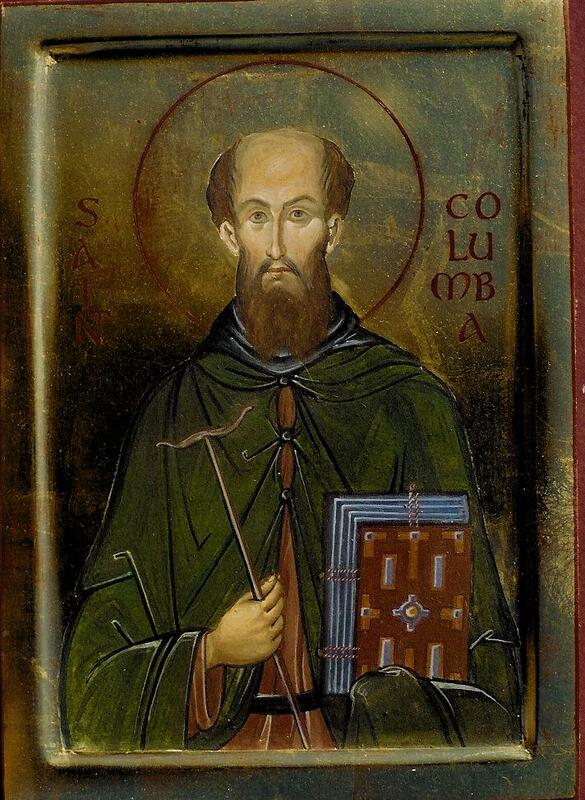 It is thought to have been created by monks of the Columban (or Scotic) Church, as a protest against the Church of Rome. 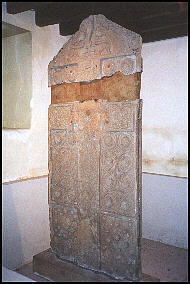 The Roman Church had sought to achieve supremacy in England by expelling the evangelical Church of Iona from Northumbria in the North of England, an area geographically close to the far south-west of Scotland where the cross was sited. 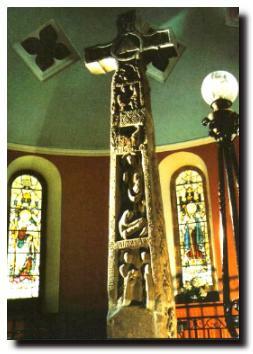 The cross is eighteen feet high, decorated with sacred carvings depicting scenes from the New Testament, and with ancient Runic letters. It was probably created in 664AD, after the Synod of Whitby. At that meeting of church-men, the presbyter Colman - Bishop of Lindisfarne, found it impossible to stand alone against the united Roman Bishops, led by Wilfrid, all of whom were committed to Roman supremacy. 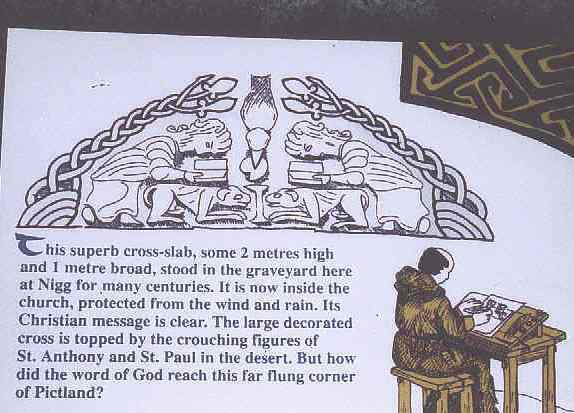 As Colman and his followers made their journey homewards, they raised a Preaching Cross at Ruthwell. In a sparsely populated land with few church buildings it was probably one of a series raised throughout Scotland. It signified the consecrated ground on which the Worship of God could be conducted, and where the Sacraments could be administered. Article published in English on: 10-3-2010.